What a great weekend! As you know, I’ve been looking forward to the Gilroy Garlic Festival for many months. This year marked the 35th anniversary of the event! I’ve been to the Festival several times and I always enjoy it. It’s really well done–everything from the food vendors at Gourmet Alley (everything garlic and free garlic ice cream!) and arts and crafts (local artisans proud to show off their beautiful wares) to the entertainment (big-time acts and even a separate stage in the Children’s area) and the much anticipated competitive events held at the Cookoff Theater like the Garlic Showdown (for professional chefs–this year hosted by celebrity Chef Carla Hall), Pigs in the Park with Garlic (a new BBQ rib competition this year), The Garlic Bowl (another new event this year, pitting college chefs from CSU Fresno, CSU San Jose, and UC Berkley against one another in a tournament-style cooking competition) and, of course, the venerable Great Garlic Cookoff, where 8 amateur cooks from all over the country compete in a live cooking competition on stage. That’s right! The Great Garlic Cookoff is one of the oldest and one of the most prestigious cooking competitions around. A real competition with a real cookoff. No social media-fueled hype or public voting is involved in the selection of recipes or in the determination of the winner. I hope they keep it that way. I’ve watched the competition from the stands several times and it’s great to just be in the audience. It’s a live competition, with real knives and real cooking. Eight cooks from different backgrounds and very unique recipes (like garlic cheesecake and duck potstickers) going knife to knife and burner to burner in a flurry of utensils and garlic. 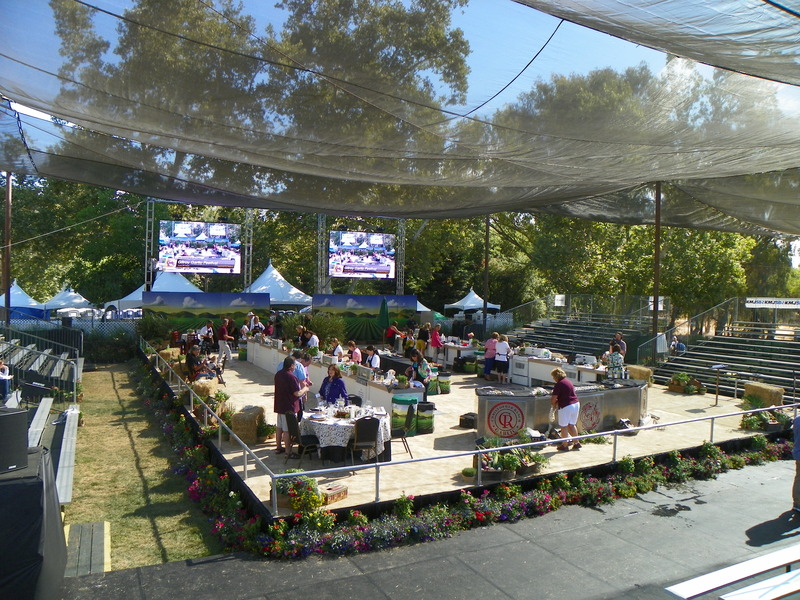 And to complicate matters for the competitors, the media is flying around the stage and get right up in the mix in the middle of prepping and cooking. There might be mistakes, there might be blood, but there are also triumphs and happy well-deserved victories (not to mention crowns made of garlic and cash prizes!). The Cookoff Theater, complete with 2 big screens. I wanted to join the action on stage, of course. I submitted my garlic-laced recipes for several years to no avail. Finally, in 2012, my recipe was chosen as a contender in the Great Garlic Cookoff: Crispy Pork Belly with Caramelized Onion and Fig Agrodolce and Creamy Polenta. I took the top prize in 2012. It was a fantastic experience. The only downside: if you win (first, second or third place crowns are awarded), you cannot enter for 3 years. Well, that’s no fun for me. So, determined to be a part of the Cookoff action, I pestered Erin Monroe, my chaperone/assistant/sous chef/food stylist extraordinaire at the 2012 competition, about allowing me to follow the action live on stage and report via the blog. She took my suggestion to her Festival and Cookoff peeps–they said yes! So, I figured out Twitter (I’d been avoiding it), set up a live feed on my blog, and headed out to the Gilroy Garlic Festival. The Festival itself runs for three days each year. The 2013 Festival began July 26 and ended July 28. 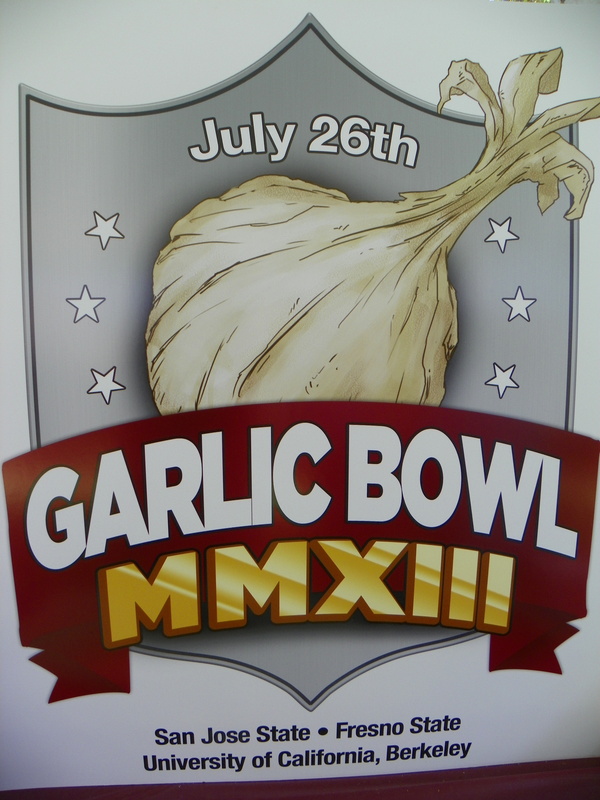 My focus, of course, is the Great Garlic Cookoff, which was held in the morning on Saturday, July 27. The evening before the Cookoff, the competitors are invited to a Welcome Dinner, where they are introduced to their “chaperone,” who will serve as their assistant during the competition. The chaperones are all veteran Festival and Cookoff volunteers and are very knowledgeable about the technicalities of the event, the rules, and all things garlic. I was excited to go to the dinner–I would be able to meet some Cooking Contest Central members that I had not met before, and I could catch up with a couple of other CCC’ers that I haven’t seen in a while. The dinner was held at the home of Tom and Valerie Obata. The Obatas have a rich history in Gilroy: Tom’s father grew garlic, tomatoes, sugar beets, bell peppers, and lettuce on his land in Gilroy for many years. Tom Sr., and his brothers, along with 14 other growers and business people, founded Gilroy Foods in 1958. Tom Jr. followed in his father’s footsteps and was a farmer and community leader until he recently retired. He and Valerie have a lovely home and it was so generous of them to open it up to the Festival and the contestants. I presented the names of all of the contestants and their recipes in a prior post, but I didn’t include any photos from the dinner. I was having trouble with my internet connection back at the hotel, so I kept my post while I was at the event short and sweet (thank you, Starbucks!). I do want to share a few of the pics from the Welcome Dinner. Scroll over each pic for a caption. Fellow CCC’er Robin Kessler (right). My guest, Lisa, with Valarie Obata. Let’s move on to Saturday! Saturday, of course, was the much anticipated Great Garlic Cookofff! First, I want to thank everyone who followed my blog and checked in on the live Twitter feed. I probably should have apologized in advance; I am a Twitter novice. I took a crash course in hashtags and proper tweeting (meaning I scoured the internet for self-help information and tutorials in the days before the cookoff). I know there were some misspellings and some flat out mistakes (that I may have blamed on autocorrect, but probably were just mistakes that autocorrect could not have caught). I was taking pics and tweeting furiously! I was actually pretty surprised at how easy it was and how well the feed integrated with my blog–even the pics looked pretty good. It was actually fun. Mary’s Scampi Style Seafood Bisque. The layers of flavor were amazing! Renata’s Roasted Garlic & Berry Gazpacho. The perfect balance of sweet and savory. Robin’s Afrikaner Butternut Tart. Complex flavors skillfully blended. Bryan tending to his leg of lamb on the rotisserie. Mary Shivers caramelized her onions and cooked her steak in her Mom’s cast iron skillet. Love it! Karen’s finished dish. Presentation was so fun! Kristine’s Mahi Mahi Laulau with Candied Bacon. So moist and delicious! Stacey’s double seafood punch of perfectly cooked salmon and crabcakes. Veteran Judge Jay Minzer had fun tasting all of the dishes. Bryan’s Garlic Rubbed Leg of Lamb–he brought his own grill with rotisserie. Good thing he’s a local! Mary Shivers plating with the help of her assistant, Erin. Mary’s Monviso & Espresso Rubbed Steak. Monviso is an heirloom garlic variety grown in Gilroy. Karen is all smiles wearing the Garlic Crown! Well done! Thanks, Margee! I’m hoping our cooking paths will cross someday–it would be great to meet you in person! The weekend went too fast! I’m so glad you came along! How’s the tattoo? LOL! 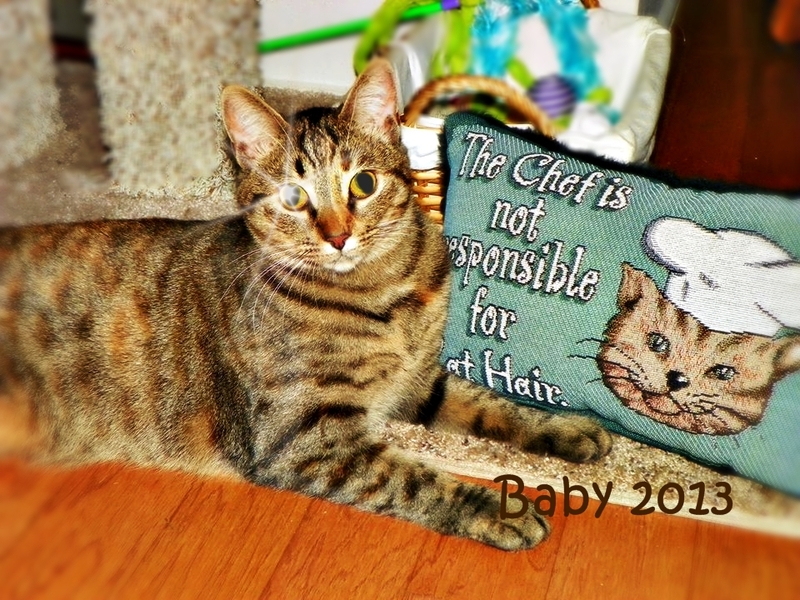 Fantastic post and great photos Laureen. I think with my winnings I am going to invent a camera that takes 10 pounds off instead of putting them on! What a fun weekend. I’m already starting to plan the dishes I’m going to enter in four years. It really is a big win just getting invited to go. I wish all contests were run this way. Hi Karen! It was so good to see you again and I’m so excited about your win. 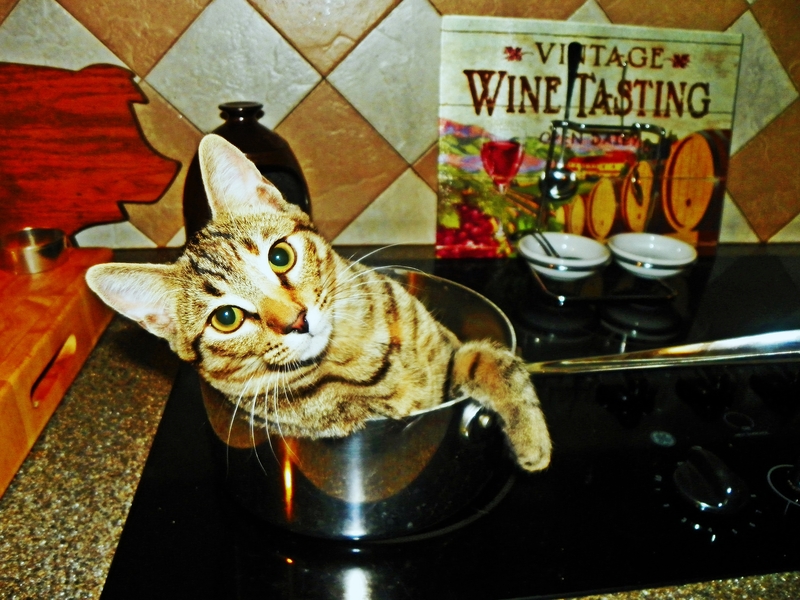 I bet our cooking paths will cross again . . . hopefully soon!